Dennis (Kim Kold) is a soft spoken semi-pro body builder trying to find the inner strength to match his outward musculature in the pleasant enough Danish film TEDDY BEAR (10 Timer til Paradis, which translates as “10 hours to Paradise”). When we first meet Dennis, he's out on a date with an attractive blonde woman who he met at the gym. Sadly, Dennis has no “game”. In fact, whatever it is that Dennis has, it's the opposite of game. That Dennis' date doesn't go particularly well sits just fine with his mother Ingrid (Elsebeth Steentoft), who has come to rely on Dennis continuing to live at home and taking care of her. While this arrangement may be convenient for mom, it's far from healthy for Dennis, who desperately wants to cut the apron strings but lacks the courage to do so. Possible salvation comes from Dennis' Uncle Bent (Allan Mogensen), who has recently married a Thai girl. In gratitude for some heavy yardwork Dennis helps him with, Bent offers to send the shy muscle man to Thailand where, he assures him, the girls are much easier to talk to. Once Dennis arrives in Thailand (after lying to mom and telling her he's in a body building competition in Germany), it soon becomes clear why these girls are so easy to talk to: the broker who helped arrange Bent's marriage is essentially a pimp, and the girls more or less prostitutes. It's not quite what Dennis had hoped for, but not wishing to be rude he tries to make the best of things. In the meantime, even on vacation a bodybuilder has to work out, and while doing just that at a local gym Dennis meets the owner, middle aged widow Toi (Lamaiporn Sangmanee Hougaard). The two genuinely connect in a big way, but for the relationship to go any further Dennis must overcome his shyness and reluctance to stand up to his mother. There are no wacky hijinks, and the prostitution aspect of the story never gets played up for its exploitation or titillation value as it surely would have been were this a Hollywood film. The performances are all understated and believable, and even Dennis' mom ultimately comes across as more sympathetic than shrewish. 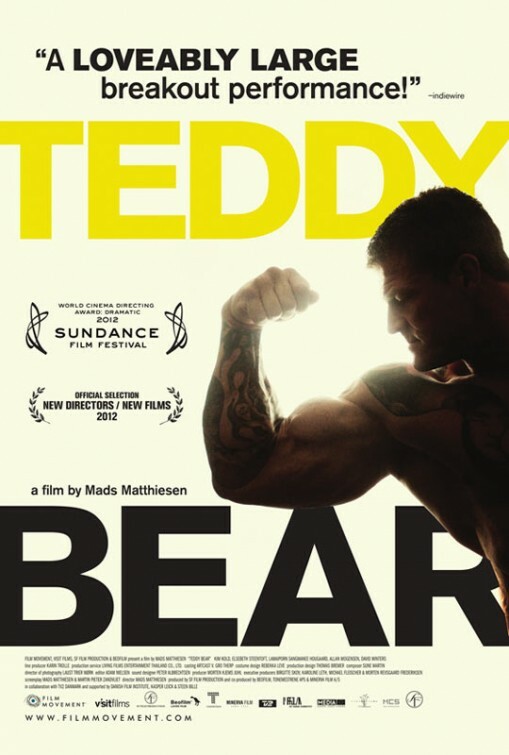 TEDDY BEAR isn't a big movie either in terms of action or themes, but it is a very good small movie. It has no real aspirations beyond wanting to tell a nice story about a nice guy and deliver a few chuckles along the way to its nice ending, and it does just that in a satisfying way without any cloying artificial sweetness. 3 out of 4 stars.